You may occasionally run across a crisis while using Microsoft Exchange Server, wherein the Exchange mailbox stores belonging to a particular Storage Group fail to mount. Generally, this behavior is seen after an abnormal termination of the Information Store service, putting your database into a 'Dirty Shutdown' state. If you find the database state to be 'Dirty Shutdown', perform a soft repair using the below command: eseutil /r "c:\program files\exchsrvr\mdbdata\priv1.edb"
This command replays the transaction log files to make sure that all the database operations are successfully completed. Perform a hard repair of your database using 'Eseutil /p' as follows: eseutil /p "c:\program files\exchsrvr\mdbdata\priv1.edb"
Defrag your database stores by using the 'Eseutil /d' command-line utility. If you fail to recover from Exchange database 'Dirty Shutdown' state using above steps, use Stellar Repair for Exchange application. This software repairs your damaged Exchange database to recover data from corrupt or inaccessible mailbox stores. It quickly scans the entire database and extracts all recoverable items from different user mailboxes, such as emails, appointments, contacts, calendar entries, notes, tasks, and journal records. Exchange Database Repair Tool has a simple three-step procedure to repair your corrupt MS Exchange databases. Initially, the software enables you to select an Exchange database from a known location or search for Exchange (.EDB) files in any specific volume in your system. Next, the software scans your database comprehensively to display all recoverable Exchange objects in the main interface. Finally, it saves all the recovered Exchange data to a new database file at user's specified location in the system. 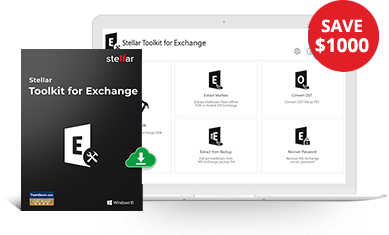 Stellar's Exchange recovery solution facilitates an accurate and precise repair of corrupt EDB file components for MS Exchange 2019, 2016, 2013, 2010, 2007, 2003, 2000, and 5.5 versions. * Download free version to scan and preview recoverable exchange mailbox items. Stellar & Stellar Data Recovery are Registered Trademarks of Stellar Information Technology Pvt. Ltd.